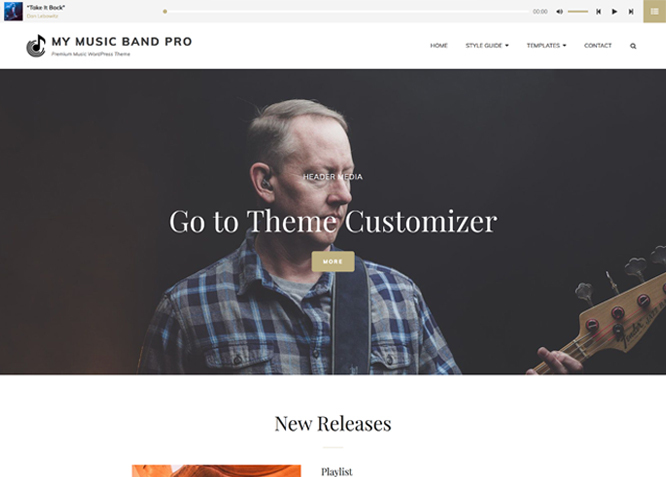 My Music Band Pro is an incredibly modern, keenly diverse, feature-rich and easy-to-use Premium Music WordPress Theme designed carefully especially for the musical artists and bands to promote their music and events. Music Band Pro provides your website with a musical vibe making it engaging and giving it a professional look. The theme is fully responsive and retina-ready; it gives your audience an excellent viewing experience, no matter what device they’re using. With features like events, header top playlist, featured slider, featured content, hero content, portfolio, playlist, promotion headline and more, My Music Band Pro gives you plenty of customizing power. You can create outstanding shopping and multi-language experience with WooCommerce and WPML integration respectively. My Music Band Pro has everything you need to get your name and voice out there, whether you are a solo music artist or a passionate music band. 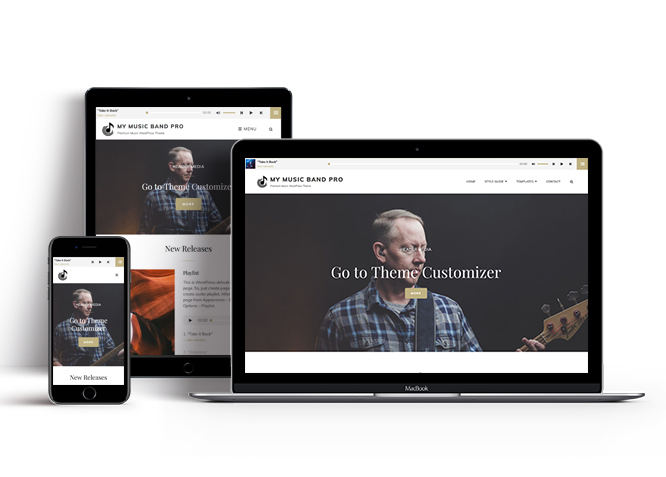 Use My Music Band Pro WordPress Theme and showcase your musical journey to the world! For any technical issue, please post in our support forum. Please download and activate Essential Content Type Plugin to activate Featured Content, Portfolio and Testimonial on your site. Music Band Pro offers exciting Menu Options! This theme supports and recommends using "Custom Menus". You can create Custom Menu through "Appearance => Menus" from your WordPress Dashboard. #How add playlist in header top? Music Band Pro supports header top playlist. It means you can add your playlist in header. Enable playlist by click on option under "Enable on"
#How to edit Menu Options? #How to add Promotional headline? Go to this linkNote:Music Band Pro supports addition of forms like contact forms, Get a Quote form,etc via plugin. All you need to do is add form's shordcode in page/post, then select the same page or post as promotional headline. #How to enable/disable scrollup options? #How to edit search option text? #How to add Testimonial in theme? 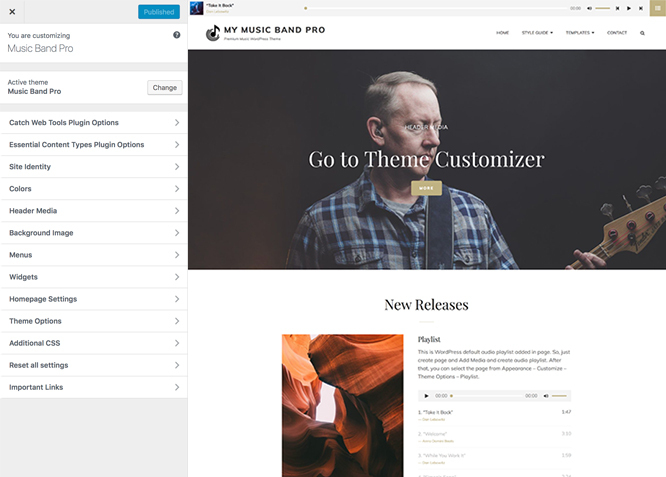 Music Band Pro currently has 16 widgetized (Sidebar) areas thay are: Sidebar, Footer One, Footer Two, Footer Three, Footer Four, WooCommerce Sidebar, 404 Page Not Found Content, Optional Homepage Sidebar, Optional Archive Sidebar, Optional Page Sidebar, Optional Post Sidebar, Optional Sidebar One, Optional Sidebar Two, Optional Sidebar Three, Newsletter and Instagram. Go to "Appearance => Widgets" or "Appearance => Customize => Widgets" in WordPress. Music Band supports Newsletter via Essential Widget Pro plugin. Activate the plugin and you will find "EW: Newsletter" in available widget list, drag the widget and place it on Newsletter widget area.